Election Tracker LIVE: Congress leader Priyanka Gandhi Vadra today said she was ready to contest the Lok Sabha election "if her party wanted". No decision has been taken yet, she asserted, with the polls a fortnight away. "I've not decided yet; If my party asks me to contest, I will definitely contest. My wish is to work for the party," she asserted. She also said Rahul Gandhi will be the prime minister if Congress comes to power in the upcoming elections, in the first such declaration by a member of the Nehru-Gandhi family. The declaration is likely to fuel BJP’s ‘dynasty’ jibes at the Congress as campaigning heats up before the first phase of polling on April 11. Priyanka Gandhi was speaking in Amethi, Rahul Gandhi's constituency. Priyanka joined the Congress in January this year, though she had been campaigning for the Congress earlier. Will Contest Polls if Asked to: Priyanka | Priyanka Gandhi Vadra has said that she will contest elections if her party asks her to "I haven't decided yet. I will contest elections if my party asks me to," Priyanka said, adding that her wish was to work for the party. Earlier, it was being speculated that Priyanka would be contesting from the Raebareli seat where she has been campaigning for the party. However, Sonia Gandhi has fielded once again from that seat. Rude shock, Sinha said over Advani being dropped from Lok Sabha polls. Actor-politician Shatrughan Sinha took to Twitter to express his displeasure over BJP veteran LK Advani being denied ticket for the upcoming Lok Sabha polls. Will Contest Polls if Asked to: Priyanka | Priyanka Gandhi Vadra has said that she will contest elections if her party asks her to "I haven't decided yet. I will contest elections if my party asks me to," Priyanka said, adding that her wish was to work for the party. The poll panel would also seek a transcript of the Prime Minister's speech, sources in the Election Commission said. 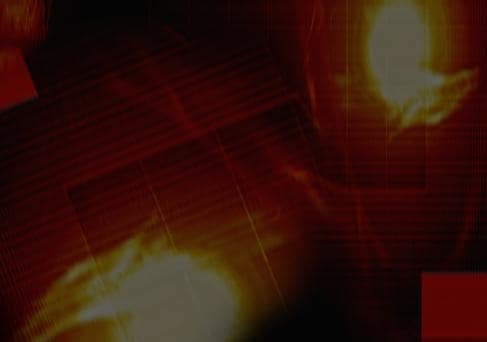 The Election Commission of India held an “internal consultation” on Prime Minister Narendra Modi’s address to the nation on India successfully testing an anti-satellite missile on Wednesday morning. According to senior officials, the poll panel would seek an “active transcript” of the Prime Minister’s speech from the government immediately and look into the “urgency” of the address. The timing of the test, conducted at 11.16am on Wednesday, and the announcement by PM Modi, an hour later, has come under question with several opposition parties alleging that it was done only for political mileage. BJP's Giriraj Singh has thanked party chief Amit Shah for listening to him "patiently". "I am not upset but I am hurt. I met Amit Shah today and spoke at length with him. I would like to thank Amit Shah for listening to me patiently," Singh said. The Delhi BJP has requested its central leadership for four rallies by Prime Minister Narendra Modi to boost its campaign in the national capital ahead of the lok Sabha elections. Delhi BJP president Manoj Tiwari said five locations have been short-listed as venues for the rallies for which permission has been sought from the central leadership. "We have requested for four public rallies of Prime Minister Narendra Modi in Delhi. I believe, we will get nod for at least two of them," he said. The possible venues which have been short-listed for the prime minister's rallies are Sant Nirankari Ground in Burari, Shastri Park, Dwarka and Mehrauli. The list of candidates for the seven Lok Sabha seats in Delhi, currently held by the party, is expected to be released in the first week of April. Party sources claimed that the announcement of candidates was getting "delayed" due to uncertainty over a possible tie up between the Congress and the AAP. 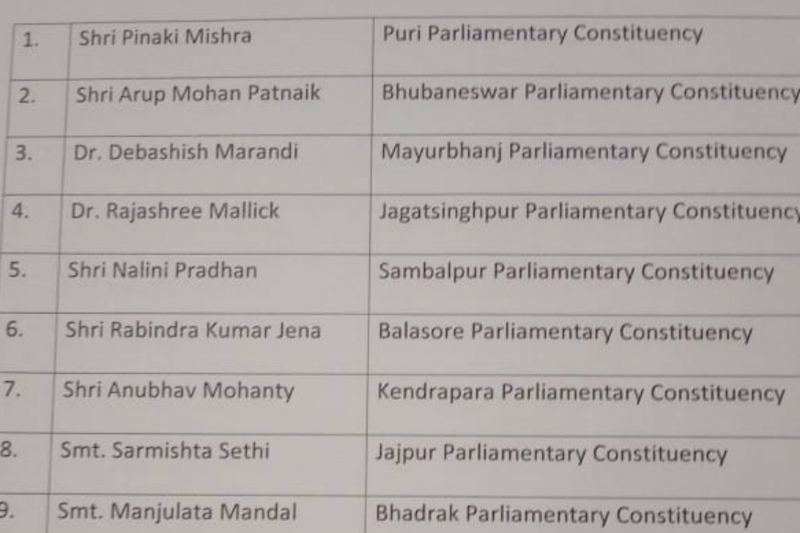 The BJD has released its list of nine candidates. Mamata Banerjee said the Goods and Services Tax would also be reviewed, and said it would be kept if it is found to be helpful. If Congress comes to power, Rahul Gandhi will be the prime minister, Priyanka Gandhi has said. There have been varying voices by the opposition leaders over Rahul Gandhi as the PM face. While HD Kumaraswamy and MK Stalin had batted for Rahul Gandhi as the prime minister, others like Tejashwi Yadav and Mamata Banerjee maintained that the decision would be taken after the polls. MGP to Take on BJP in Both Lok Sabha Seats in Goa | Hours after two of its MLAs decided to cast their lot with the ally BJP, the Maharashtrawadi Gomantak Party (MGP) announced Wednesday that it would contest both the Lok Sabha seats in Goa. MGP president Dipak Dhavalikar said the party's another MLA, Sudin Dhavalikar, will contest from South Goa while former MLA Naresh Sawal will contest from North Goa. TMC Promises to Review GST | The TMC manifesto promises to double 100 days work scheme to 200 days and also the wages, review the present GST. "We Will revive Planning Commission which was dissolved by the Modi government ," the TMC has said in its manifesto. The TMC has released its poll manifesto in which it has promised probe into demonetisation if the opposition alliance comes to power after the Lok Sabha election. PM to Address Rally in Uttarakhand Tomorrow | Prime Minister Narendra Modi will address a rally at Uttarakhand's Udham Singh Nagar district on Thursday. The prime minister is scheduled to address the rally at the district's Rudrapur city at 11 am, Pradesh BJP working president Naresh Bansal told reporters here. Bansal assumed the office of the Pradesh BJP working president on Wednesday as its former chief Ajay Bhatt has been fielded by the party from the Nainital Lok Sabha seat. Modi had arrived here last month to address a Vijay Shankhnad rally at Rudrapur last but could not make it to the venue due to bad weather. However, he had addressed the rally through a mobile phone. Limitless Drama to Reap Political Benefits, Says Mamata |Trinamool Congress Chief Mamata Banerjee Wednesday hit out at Prime Minister Narendra Modi over his announcement about India's successful demonstration of anti-satellite missile capability, saying it was "yet another limitless drama" to "reap political benefits" ahead of the Lok Sabha polls. Terming it a gross violation of the model code of conduct, Banerjee said there was "no great urgency" of announcing the mission by a government "past its expiry date" and asserted that it seems to be the "desperate oxygen to save the imminent sinking of the BJP boat". She said she will lodge a complaint with the Election Commission. revised nomination figures late Tuesday night said in a release. EC to Send Notice to BJP Over 'Mai bhi Chowkidaar Video' | The EC on Wednesday issued a show cause notice to a member of the BJP's National Election Committee for sharing an audio-visual advertisement titled "Main Bhi Chowkidar Hun" on social media without complying with the directions of the poll body, an official said. He said Neeraj has been directed to submit a reply within three days. The poll body's Media Certification and Monitoring Committee (MCMC) had issued a certificate dated March 16 to Neeraj "in respect of the said advertisement subject to the exclusion of the clips depicting Army personnel", Delhi's chief electoral office said. Ram Madhav hit out at the National Conference-Congress alliance in the state and dubbed its seat-sharing pact as a "drama". "This drama that is going on that they are in alliance in Jammu, but fighting in Kashmir. They are trying various types of exercises against Modi and the BJP, let them do it. We will win two seats in Jammu and one in Ladakh and will try our best in Kashmir so that our candidates go forward," he said. "We want that all the valley seats should go to those who stand for unity of the country," he said, adding that those politicians who indulge in doublespeak should be kept away. BJP Hopeful of Better Result in J&K: Madhav | The BJP hopes to perform better in J&K in the upcoming Lok Sabha polls than it did in the 2014 parliamentary elections, party's national general secretary Ram Madhav said here on Tuesday. He exuded confidence that the BJP will win all the three seats in Jammu and Ladakh. AAP Names 15 Star Campaigners for Delhi | The AAP has come up with 15 names to be the party's star campaigners in Delhi, senior party leader Gopal Rai said. These names would be submitted to the Election Commission for approval on Wednesday and they would come up with more names in the coming weeks. "A total of 40 star campaigners will be campaigning for the party in Delhi," he said. Delhi Chief Minister Arvind Kejriwal, Deputy Chief Minister Manish Sisodia and senior party leaders Satyendra Jain, Sanjay Singh and he are among those chosen by the party, Rai said. The other names on the list include party members Bhagwant Mann, Sushil Gupta, ND Gupta, Imran Hussain, Kailash Gahlot, Saurabh Bhardwaj, Rajendra Pal Gautam, Rakhi Birla, Jarnal Singh and Shahnaz Hindustani, he told reporters here. Union Minister Giriraj Singh to Contest From Begusarai | BJP president Amit Shah confirms that the party will fielding Union Minister Giriraj Singh from Bihar's Begusarai constituency. Singh had earlier expressed discontent with the BJP leadership in Bihar for changing his seat from Nawada to Begusarai in Bihar without consulting him. He will be pitted against CPI's Kanhaiya Kumar. Gandhi says, "I am guaranteeing the OBC community. Congress will give you your deserved space. We have given you two OBC CMs." Meanwhile, at the AICC OBC National Convention party chief Rahul Gandhi says, "Congress promises you that when we come to power we will deposit Rs3.5lakh over a period of 5 years. We will give you NYAY. We talk about Nyay while they talk about Anyay." Taking a swipe at the ruling BJP Matondkar says, "The unemployment rate has increased drastically. Where is the youth going to go if the choices are now limited?" Milind Deora, however, refused to comment on which constituency Matondkar will be fielded from. In a press conference at Congress headquarters in Delhi, Matondkar says, "Today is an important day for me because I am entering into politics. There is now doubt about the state of freedom in our country. To voice those concerns I have decided to enter the political fray. I am here because I believe in the ideology of the Congress." The press conference is also being attended by Congress spokesperson Randeep Surjewala, Maharashtra Congress chief Milind Deora and former state chief Sanjay Nirupam. Urmila Matondkar Officially Joins Congress | After days of speculation over her political foray, actor Urmila Matondkar joins the Congress. In a series of tweets, Mamata Banerjee hits out at PM Modi for his Tuesday announcement saying, "There is no great urgency in conducting and announcing the mission now by a government past its expiry date. It seems a desperate oxygen to save the imminent sinking of the BJP boat. We are lodging a complaint with the Election Commission." The Trinamool Congress released its poll manifesto on Wednesday, promising to probe the demonetisation exercise if the opposition alliance comes to power. Mamata Banerjee’s party has also promised to revive the Planning Commission, which was dissolved by the Narendra Modi Modi government, review the Goods and Services Tax, and promise to double 100 days’ work scheme to 200 days, and also double the wages. BJP chief Amit Shah today announced that Union minister Giriraj Singh, who was miffed with the party over changing his seat from Nawada to Begusarai in the upcoming elections, will contest from Begusarai where he faces CPI candidate Kanhaiya Kumar. Singh had said his self-respect was hurt as “no other MP’s seat was changed in Bihar”. “It was decided without talking to me. State BJP leadership should tell me why it was done. I've nothing against Begusarai but I can't compromise with my self-respect,” Singh had said. 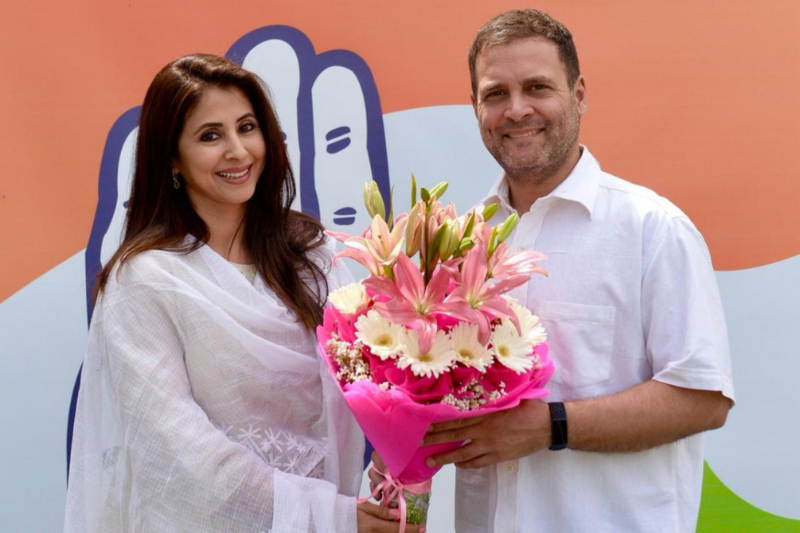 Meanwhile, actor Urmila Matondkar met Congress chief Rahul Gandhi and joined the party today in the presence of Mumbai unit chief Milind Deora, Randeep Singh Surjewala and Sanjay Nirupam. It is likely that Matondkar will be fielded from Mumbai North constituency where she will be up against BJP candidate Gopal Shetty. "I am here because I believe in the ideology of Congress and what the party stands for. I have not joined the party for the sake of elections," she told reporters. "I am here to stay," she said, adding her entry in the Congress was not about elections. Former finance minister P Chidambaram today defended the Congress’s proposed income scheme Nyay, saying the Indian economy had the capacity to implement the scheme, which would be rolled out in phases. Addressing a press conference, Chidambaram also hit out the Narendra Modi government, saying no one questioned the Prime Minister on the math of his 2014 poll promise where he said Rs 15 lakh would be deposited in the bank account of every Indian. He added that existing schemes for the poor like ICDS will not be scrapped and thus people had nothing to fear. “Subsidies which have been granted to achieve special socio-economic objectives will not be affected by NYAY,” Chidambaram said. Meanwhile, Bharatiya Janata Party general secretary Ram Madhav said the BJP has asked the Election Commission to hold Assembly elections in Jammu and Kashmir as early as possible. Meanwhile, Bollywood actor Urmila Matondkar is expected to join Congress in the presence of Rahul Gandhi today. Congress general secretary Priyanka Gandhi Vadra will visit the party bastions of Amethi, Rae Bareli and Faizabad beginning today, in her next leg of campaigning in Uttar Pradesh. In West Bengal, Trinamool chief Mamata Banerjee is expected to release her party's manifesto in the state capital. Earlier this month, Gandhi had taken river route to visit parts of eastern Uttar Pradesh, including Prime Minister Narendra Modi's constituency Varanasi. She will arrive in Amethi, the parliamentary constituency of her brother Rahul Gandhi, and hold a meeting with booth-level party presidents. The leader is said to interact with 1,965 party booth presidents at the AH Inter college in Musafirkhana. After the meeting, she will leave for Rae Bareli where she will hold a programme on Thursday. The AICC general secretary's visit to Faizabad has been rescheduled for March 29. She was earlier scheduled to visit the temple town on March 27. The detailed programme of the Congress leader is being worked out, party sources added. Meanwhile, Trinamool chief Mamata Banerjee is expected to release her party's manifesto in Kolkata today. The party is expected to include solution for Kashmir issue in its poll paper. Besides that, issues ranging from unemployment to farmers' policy may also find a mention in Trinamool's poll promise.